A molcajete is a large mortar and pestle made from volcanic stone used to prepare Mexican food, particularly salsas. Think of the molcajete as a Prehispanic blender or food processor. There are two parts to a molcajete the mortar or base which is called the molcajete and the pestle or grinder which is called the “mano” or hand in Spanish. Disclosure: Some of the links are affiliate links, meaning, at no additional cost to you, we will earn a small commission if you click through and purchase a product. We only recommend authentic products that we use ourselves and love. Why Use a Molcajete Instead of a Blender? The grinding action of the molcajete releases the essential oils of the ingredients you are processing which adds depth of flavor to your food. Preparing food in a blender chops the food instead of grinding it which releases less flavor and gives it a different texture. Molcajetes are simple to use but do require more physical effort than blenders or food processors. You may think, “I don’t want to make any extra effort when I cook. Cooking is enough effort.” But, I promise you the extra effort is worth it. Chop any ingredients that you plan on preparing in the molcajete. It makes processing easier and gives your food a more uniform texture. The finer you chop the ingredients before adding them the smoother your food will be. Start adding the ingredients in small batches. Don’t dump all of the ingredients in at once. Using the “mano” press and then twist the food to break it down. Add more until all ingredients are fully incorporated and blended to the desired texture. If it feels awkward at first, you will get the hang of it after a few uses. Don’t worry. Molcajetes come in many sizes or shapes. The smaller sizes are used to make portions for one or two people and the larger ones to make family sized portions. Molcajetes have personalities. If you can, try a few out. Hold the “mano” in your hand and practice grinding with it. Do the same in another and then another until you find one that feels most comfortable. There is no right or wrong when choosing. Choose the one that feels most comfortable to you and the size is appropriate for the amount of food you want to make with it. Most new molcajetes need to be “cured” before you use them. Curing doesn’t mean oiling it and heating it the oven like you would with a cast iron skillet. Curing means smoothing out the interior and removing and grit. To cure a new molcajete, add a few tablespoons of rock salt or dry white rice. Use your pestle or “mano” to grind it thoroughly. As you grind, the salt or rice will turn gray and you will notice some grit. Discard the ground mixture and then add a few more tablespoons of salt or rice and grind again. 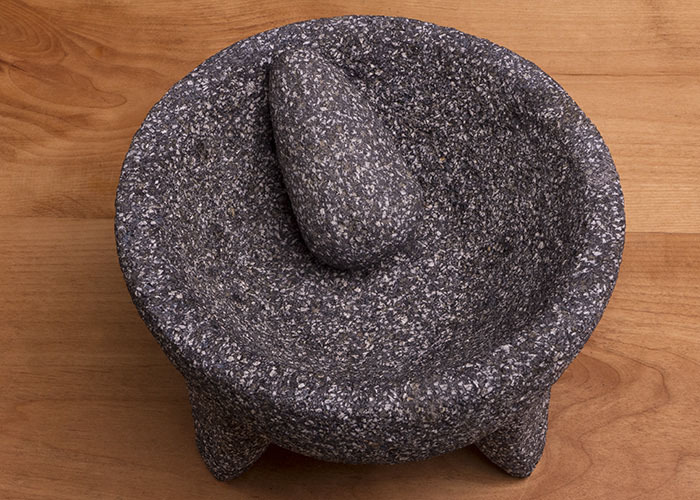 When the salt or rice no longer turns gray when you grind it the molcajete is now “cured.” Rinse the molcajete and “mano” under running water and it is ready to use. Molcajetes are easy to clean. Just scrape out any remaining food and then rinse it under hot running water. Use a kitchen brush to remove any food that is stuck. Add a couple of drops of dish soap and then scrub some more with your kitchen brush. Rinse again thoroughly with hot water to ensure no soap residue remains. Pat dry with a kitchen towel and allow it to dry completely before putting it away. A molcajete will last nearly forever. If you clean it regularly and don’t drop it on a hard surface you will be able to pass it on to the next generation. And, they should be able to pass it on to the next. 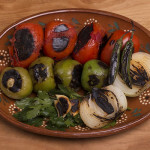 "Salsa Molcajeteada" a handmade roast tomato and tomatillo Mexican salsa prepared in a traditional stone molcajete. Char all the vegetables except the cilantro well. Coarsely chop the onions, tomatoes, tomatillos and serrano chiles. Add the Roma tomatoes and tomatillos and grind until desired consistency is reached. You can substitute jalapeños for the serrano chiles.You can make the salsa with just Roma tomatoes or just tomatillos. If you prefer a less chunky salsa, chop the ingredients finer before grinding them in the molcajete. Really charring the ingredients adds lots of flavor to the salsa. You do not need to remove the seeds and veins from the chiles. Be sure to add enough salt to the salsa so that all of the flavors really pop. The salsa should be a little bit salty when you taste it on its own. When you add it to your food it won't taste as salty. You can also make this salsa in the blender. It will still taste great. It keeps well in the refrigerator for up to 3 days. 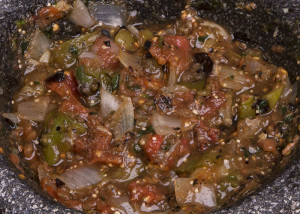 The name "salsa molcajeteada" means salsa made in a molcajete. 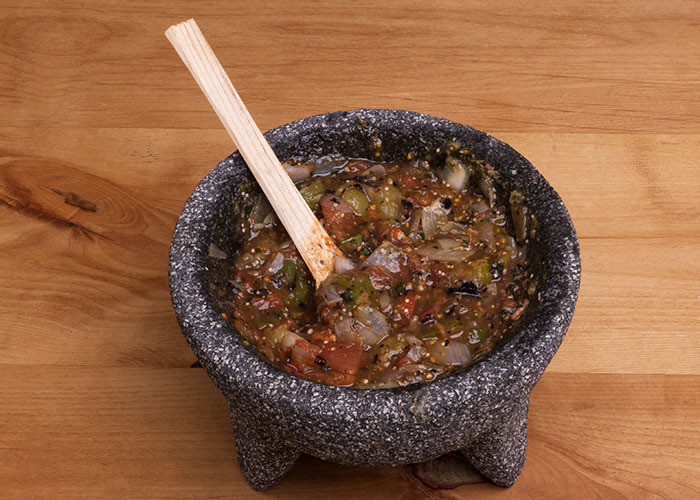 Another great salsa recipe you can prepare in molcajete is our Classic Mexican Salsa. How to Make Guacamole in the Molcajete. Molcajete is one of the tastiest salsas. I could eat it by the cup full. Thank you so much for this recipe. I’m inspired by your cooking story and where you’ve come from and so grateful for you sharing these beautiful recipes and techniques. I am from the PNW and although we have our Mexican restaurants, it’s hard to find some real authentic heritage recipes. These recipes are going to become regular staples in my kitchen. Muchas Gracias! Where did you buy your molcajete in the photos? I bought the molcajete shown in the photos in Mexico. Crate and Barrel sells good quality molcajetes in the US. Most Mexican ‘supermercados’ sell them too, along with those heavy aluminum pots & lids that make the best rice!! These two items are in every good Latino kitchen!? Thanks so much for posting this wonderful and informative article!! I use this same recipe, when I make tacos de pastor. Really kicks up the flavors nicely and compliments eachother well. I like chunky salsa or as my wife calls it “sloppy salsa”. One thing I like doing is tossing the salsa into my cast iron after I finish cooking my pastor. One helps clean up the pan, and adds tons of flavor, but doesnt kill the taste of the salsa itself. I just made this recipe and it is stupendous! It’s healthy and delicious! Just learned so many new things today! Can’t wait to try out this recipe and cured my own moljacete. Thanks so much for sharing! My only disagreement in what you said was the use of dish soap. I do not even use soap on my marble mortar and pestle which is a very dense and non-porous. I feel volcanic rock is too porous and soap will still get trapped in the rock and impart flavor to whatever you make next. Also the use of the molcajeta is great for stress relief, right up there with kneading bread.